This tutorial assumes that you have already installed the Ubuntu Desktop dependencies and development tools mentioned in Part 3/5. Compiz, Nux and Unity 7, the 3 main programs of the official Ubuntu Desktop Environment are written in C++. Their source code is stored in bazaar (bzr) repositories on Launchpad (http://launchpad.net). Nux uses an autotools based build system, whereas Unity and Compiz use cmake. This is a short description of the current (Unity 7) Ubuntu Desktop structure. 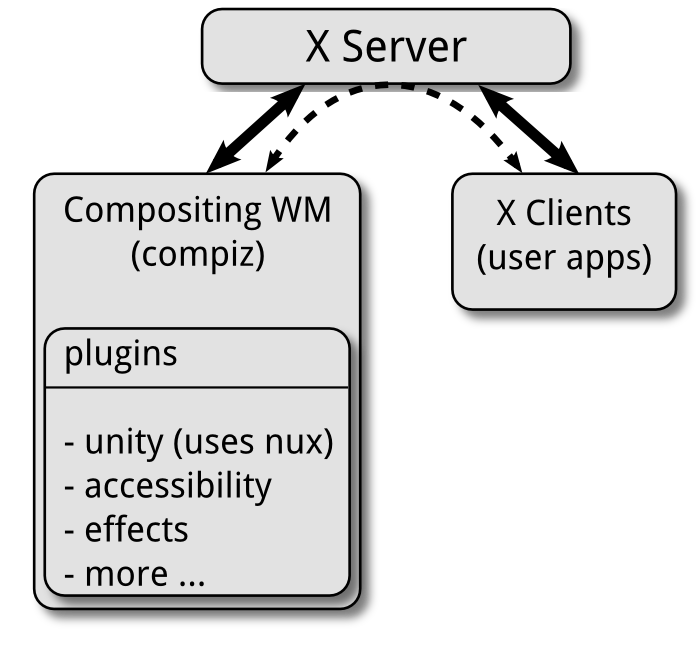 To begin with, the Ubuntu desktop consists of three main programs (nux, compiz and unity) that interact with a fourth one: the well known X server.